Heliospectra AB develops innovative LED lighting solutions leveraging its extensive light spectrum and intensity research. The company’s innovative engineering and software enables customers of any size to customize their own light recipes that are optimized to specific plant genetics. 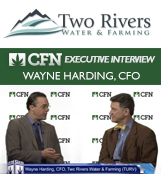 In this CFN interview, Wayne Harding of Two Rivers & Farming Company comments on his company’s contribution to the legal marijuana industry, why he’s come to the Cannabis World Congress & Business Expo in NYC, and how his company will evolve and capitalize on the industry over the next year. 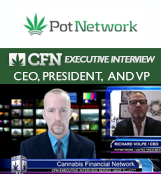 In this CFN interview we speak with Award-Winning Journalist and PR Specialist Andrew Hard of Medical Marijuana Inc. (OTCQB: MJNA). With more than a dozen years of experience as an investigative journalist, Andrew Hard brings an impressive array of national media contacts to the table, along with a passion for strategic communications and helping clients achieve national and international exposure for their products and brands. 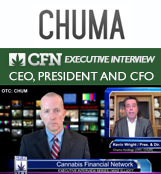 In this CFN interview Cameron Cox of FutureLand Corporation discusses their focus on target zoning, license fulfillment, site plan preparation and financing of cannabis or hemp grow facilities throughout the United States. They monetize through leasing the land, leasing the structures on the land, financing interest revenue and management fees associated with cultivation centers. 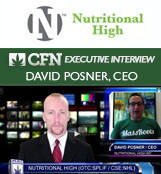 In this CFN interview, Chris Boucher of CannaVEST explains their focus on agricultural hemp. CannaVEST is creating a massive supply chain to make cannabidiol affordable to everyone. 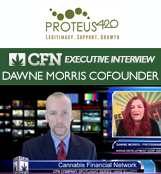 The hope is to educate the public on CBD and supply companies with the materials to make their own product. 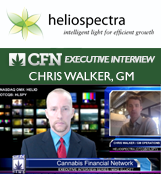 In this CFN interview, Jim Smeeding of CannaPharmaRx comments on cannabinoid-based research, science, data, and evidence of benefits to patients. CannaPharmaRx is a pharmaceutical company who is advancing discovery in cannabinoid-based medicines to help patients prevail over chronic and acute medical conditions. 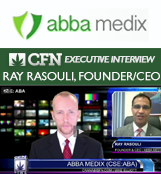 Their mission is to bring cannabinoid-based products to the U.S. market and worldwide. 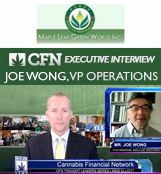 One World Cannabis Ltd. is an Israeli-based company founded in 2014 by a group of professionals with expertise in the field of medical cannabis treatment and medical cannabis regulatory affairs. 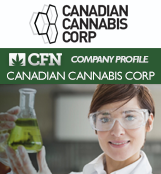 The company’s Research Division is focused on pursuing clinical trials evaluating the effectiveness of cannabinoids in the treatment of various medical conditions. 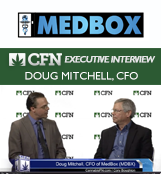 Medbox, Inc., (OTCQB: MDBX), a leader in the rapidly emerging cannabis sector, provides specialized services to operators of dispensaries, cultivation centers, manufacturers and research facilities in those states where approved. Through trusted clients and affiliates, the company promotes efficient, consistent, high quality products that are priced right, readily available and safely packaged. Amfil Technologies recently launched joint venture with ACTS-systems for the Grozone line of products geared towards the Medical Marijuana and legal grow and processing facilities including edible and extract facilities worldwide. 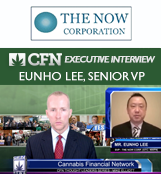 Watch Sam May, of Cabinet Grow, in this CFN interview discuss his company’s growth in the cabinet sized grow system industry. Cabinet Grow, Inc. was formed to fill the gap in the small scale homegrown horticultural market and through its’ predecessor, Universal Hydro, began operations in California in 2008. 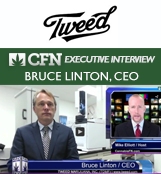 This CFN Interview with Angel Stanz, CEO of BudGenius.com and BG Medical Technologies, Inc. (OTC:RIGH), examines the role of cannabis testing in the marijuana and cannabis industry. Accurate testing gives cannabis patients and consumers insight so that they may better choose the best strain for their particular wants and needs. Terra Tech. is pioneering the future by integrating the best of the natural world with technology to create sustainable renewable solutions for food production, indoor cultivation, and agricultural research and development. The future of farming is both indoor and vertical in highly productive and controlled environments. The MaryJane Group is the leader and creator of the canna-lifestyle hospitality sector, committed to strengthening the recreational cannabis industry through their unique brand portfolio and trusted partnerships. MassRoots is one of the largest and most active communities of cannabis consumers with 325,000 users and over 500 dispensaries. 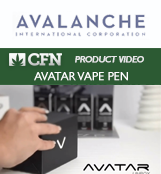 They are affiliated with the leading organizations in the cannabis industry, including the ArcView Group and National Cannabis Industry Association. 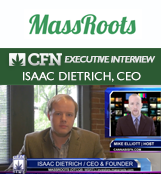 MassRoots has been covered byCNN, CNBC, Fortune, BBC, Cannabist and the New York Times. 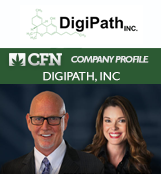 DigiPath, Inc. is a leader in creating and marketing innovative pathology solutions for corporate, private and academic clients. 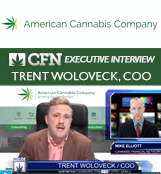 In this interview CFN’s Dan Wise asks Trent Woloveck, COO of American Cannabis Company (OTCQB: AMMJ), about the role of consulting in the marijuana and cannabis industry. Discussion also includes new products such as The Cultivation Cube™ and The Satchel™. 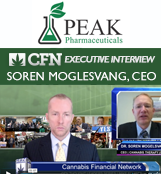 Peak Pharmaceuticals Inc. aims to develop and market safe, phytocannabinoid-based medicinal products and to apply rigorous manufacturing and quality control standards to become a global leader in the research, development, manufacturing, testing and marketing of cannabinoid ingredients and therapies. 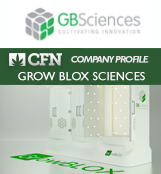 GrowBLOX Sciences, Inc.—aka GB Sciences (OTCQB: GBLX)—merges state-of-the-art technologies in plant biology, cultivation technology and post-production processes. 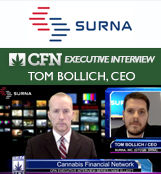 Tae Darnell, Principal Executive Officer of Surna Inc discusses his company’s technological advances in the cannabis industry. Surna develops technology infrastructure, such as water-chilled climate control systems, allowing growers to reduce the energy footprint while increasing yield. 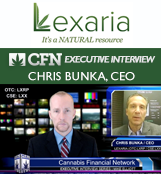 Lexaria Corp is an aspiring producer of medical marijuana under Canada’s Marihuana for Medical Purposes Regulations (“MMPR”). 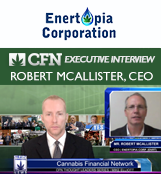 On March 5, 2014, the company signed a joint venture with Enertopia Corp. (OTC: ENRT) (CSE: TOP) with the goal of bringing a 60,000 square foot cultivation facility online. 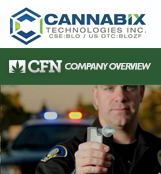 Cannabix Technologies Inc. is the developer of the patent pending Cannabix Marijuana Breathalyzer for law enforcement. Enertopia Corp. is focused on low-risk, high-reward projects that will generate shareholder value through the timely acquisition and development. 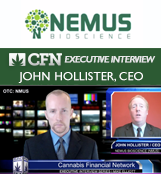 Novus is comprised of seasoned Wall Street veterans that have focused its business model in the healthcare portion of the medical cannabis industry. 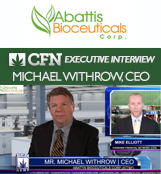 In this episode of the Cannabis Financial Network Executive Interview Series we talk to Abattis Bioceuticals CEO Michael Withrow about the rapidly growing Canadian and U.S. cannabis markets and its role within them. 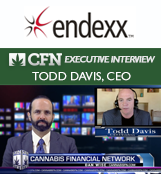 Endexx provides innovative medical marijuana management and technology solutions. 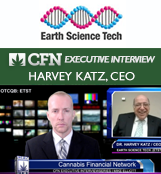 Earth Science Tech Inc. is a unique Biotechnology company focused on delivering cutting edge Nutraceuticals, Bioceuticals and Dietary Supplements. 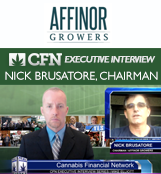 Affinor is focused on developing growing systems for the medical Marijuana industry and food crops such as Strawberries, Spinach and Lettuce. 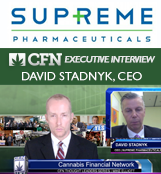 Supreme Pharmaceuticals Inc. is a company dedicated to securing multiple producing medical marijuana facilities in Canada. 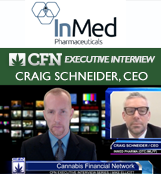 InMed Pharmaceuticals Inc. is a biopharmaceutical drug discovery and development company uniquely focused on the pharmacology and therapeutic potential of cannabinoids. ORGANIGRAM, is licensed by Health Canada to be an Authorized Licensed Producer under the Marihuana for Medical Purposes Regulation (MMPR). 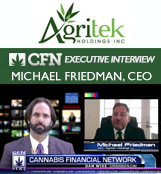 Agritek Holdings, Inc. (www.Agritekholdings.com), the first fully reporting Company and pioneer within the medicinal marijuana space provides innovative patient and agricultural solutions. Maple Leaf is a Canadian company that focuses in the agricultural/environmental industry. 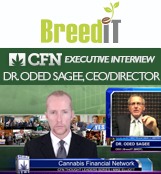 BreedIT Corp (BRDT), through its Israeli subsidiary, BreedIT Ltd http://www.ibreedit.com, is the developer of highly sophisticated agro-breeding solutions for plant breeders and researchers.